Autodesk’s latest release of InfraWorks focuses on new capabilities for designing complex and customized civil structures and makes improvements that strengthen the connections between InfraWorks and BIM 360, and between InfraWorks and GIS data. The company announced four key upgrades to InfraWorks. Supporting complex bridge design — Starting with this update, use Generic Bridge Objects along with other bridge components like piers, abutments, and girders, to design a wider range of bridge types and take preliminary designs further in InfraWorks. Generic bridge objects are parametric components that can be positioned at any station or offset along a bridge. The components can be created in Autodesk Inventor and then utilized in InfraWorks via the Generic Objects library. Generic bridge objects are attached to the bridge and can be positioned numerically for accuracy. The generic bridge objects have many applications; not only can they be used to model unique, specialized parametric bridge parts to attach to the bridge, but they can also be used to form the actual structure itself, for example, arc structures. They can also help form non-bridge items such as construction equipment. Enhanced integration with ArcGIS data — Last year at Autodesk University, Autodesk announced a strategic alliance with Esri. The companies said that working together to create direct, faster, and more transparent data flow between their systems will enable their customers to positively impact the way they design and construct the built environment. Learn more about what’s next for Autodesk and Esri at www.infrastructure-reimagined.com/esri-autodesk-whats-next. In this latest update, the Autodesk Connector for ArcGIS graduated from Preview status and also includes a few improvements to the workflow. Implementing ArcGIS data improves project context, which will lead to better designs. Users can preview selections and build up several selections from multiple layers before bringing the data into InfraWorks. ArcGIS content can now be added to an existing or new InfraWorks model. Users can select feature layers, configure them to InfraWorks objects, and add layers to a design project. Once the data has been imported into InfraWorks, layers can be reconfigured and restylized based on the ArcGIS attributes. This allows users to drive custom stylization based on the rich attribution. InfraWorks attributes and layers are automatically expand when connecting to ArcGIS. The connection from InfraWorks to ArcGIS is also live and refreshable; that means we can use field applications like the Collector for arcGIS to collect additional assets. Once ArcGIS is updated, the InfraWorks model can be refreshed and the new assets will be added to the model. InfraWorks and BIM 360 data sources — It’s now possible to store, manage and share data sources for an InfraWorks model on the Desktop Connector, which will sync the data sources to BIM 360 or Autodesk Drive. This means anyone else working on the model will also have access to the same data sources, allowing the project team to reconfigure and refresh the data sources as needed for their work. Content such as shapefiles can be located in BIM 360 folders and added as a data source, configured with relevant data type and geolocation information. After importing the data, the connection string points to the local location. The process is the same for other data types such as 3D models. Just browse the Desktop Connector local hub and then configure the data source and position the 3D model numerically or interactively. Once the model has been synced, other project collaborators gain access to the model and those elements sourced from the Desktop Connector also point locally on the collaborator’s model. InfraWorks Home menu upgrades — Model tiles on InfraWorks Home now provide many more actions for managing BIM 360 and non-BIM 360 cloud models from one place. Status icons indicate when models are locked on BIM 360 or disconnected. Managing models from InfraWorks Home is now a more seamless experience and prevents unwanted or leftover connections. Improvements to the InfraWorks home menu allows users to open a model directly in InfraWorks or in BIM 360 where full view capabilities are available. InfraWorks allows users to create a duplicate model that can be stored and modified locally. If a model has been removed from BIM 360, a local copy of the now disconnected model can be created. This is useful if you need to work on the model but cannot connect to BIM 360. 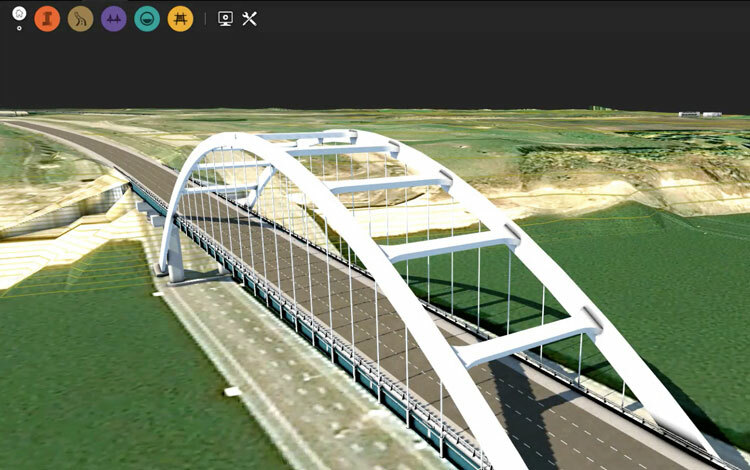 InfraWorks allows users to delete cached models without affecting what’s on BIM 360, freeing up space. You can also easily delete local models.